The European Commission has prohibited Siemens' proposed acquisition of Alstom under the EU Merger Regulation. The merger would have harmed competition in markets for railway signalling systems and very high-speed trains. The parties did not offer remedies sufficient to address these concerns. Commissioner Margrethe Vestager, in charge of competition policy, said: "Millions of passengers across Europe rely every day on modern and safe trains. Siemens and Alstom are both champions in the rail industry. Without sufficient remedies, this merger would have resulted in higher prices for the signalling systems that keep passengers safe and for the next generations of very high-speed trains. The Commission prohibited the merger because the companies were not willing to address our serious competition concerns." Today's decision follows an in-depth investigation by the Commission of the takeover, which would have combined Siemens' and Alstom's transport equipment and service activities in a new company fully controlled by Siemens. It would have brought together the two largest suppliers of various types of railway and metro signalling systems, as well as of rolling stock in Europe. Both companies also have leading positions globally. The merger would have created the undisputed market leader in some signalling markets and a dominant player in very high-speed trains. It would have significantly reduced competition in both these areas, depriving customers, including train operators and rail infrastructure managers of a choice of suppliers and products. As regards signalling systems, the Commission's investigation confirmed that Chinese suppliers are not present in the EEA today, that they have not even tried to participate in any tender as of today and that therefore it will take a very long time before they can become credible suppliers for European infrastructure managers. Remedies proposed by merging companies must fully address the Commission's competition concerns on a lasting basis. Where concerns arise because of loss of direct competition between the merging companies, remedies providing a structural divestiture are generally preferable to other types of remedies. This is because they immediately replace the competition in the markets, which would have been lost from the merger. These types of structural solutions were offered by parties and accepted by the Commission in past mergers such as BASF's acquisition of Solvay's nylon business, Gemalto's acquisition by Thales, Linde's merger with Praxair, GE's acquisition of Alstom's power generation and transmission assets or Holcim's acquisition of Lafarge. 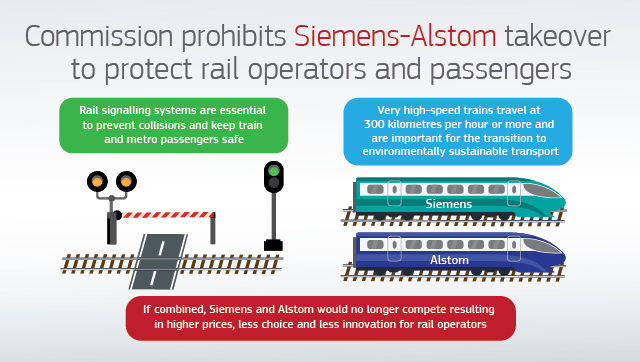 In very high-speed rolling stock, the parties offered to divest a train currently not capable of running at very high speeds (Alstom's Pendolino), or, alternatively, a licence for Siemens' Velaro very high-speed technology. The licence was subject to multiple restrictive terms and carve-outs, which essentially would not have given the buyer the ability and incentive to develop a competing very high-speed train in the first place. This confirmed the Commission's view that the remedies offered by Siemens were not enough to address the serious competition concerns and would not have been sufficient to prevent higher prices and less choice for railway operators and infrastructure managers. Siemens,based in Germany, is active worldwide in several industrial areas with its mobility division offering a broad portfolio of rolling stock, rail automation and signalling solutions, rail electrification systems, road traffic technology, IT solutions, as well as other products and services concerning the transportation of people and goods by rail and road. Alstom, based in France, is active worldwide in the rail transport industry, offering a wide range of transport solutions (from high-speed trains to metros, trams and e-buses) and related services (maintenance and modernisation), as well as products dedicated to signalling solutions, passengers and infrastructure, rail electrification systems and digital mobility. The vast majority of notified mergers do not pose competition problems and are cleared. From the moment a transaction is notified, the Commission generally has a total of 25 working days to decide whether to grant approval (Phase I) or to start an in-depth investigation (Phase II). There are three on-going phase II merger investigations: the proposed acquisition by Vodafone of Liberty Global's business in Czechia, Germany, Hungary and Romania, the proposed acquisition of Whirlpool's refrigeration compressor business by Nidec and the proposed creation of a joint venture by Tata Steel and ThyssenKrupp. More information will be available on the Commission's competition website, in the public case register under the case number M.8677.